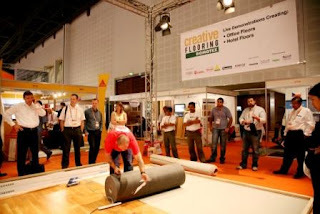 DOMOTEX Middle East took place this past May 10th through 12th, 2010 in Dubai, United Arab Emirates. Here are highlights. This first picture gives you a sense of what makes this show in Dubai so very unique. It is of the DOMOTEX Middle East 2010 ribbon cutting ceremony just as the UAE Minister of State, Her Excellency Reem Al Hashemi, cuts the opening day ribbon. Angela Schaschen, Managing Director of Deutsche Messe Dubai stands to her right. For the first time, DOMOTEX Middle East was held in combination with R+T Middle East, the Middle East spin-off of the world’s leading show for roller shutters, doors, gates and sun-protection systems. The result was a resounding success with 225 exhibitors from 34 countries. For more perspective on this show and its success, I invited Ms. Angela Schaschen, General Manager of Deutsche Messe’s Dubai branch and organizer of both shows, to answer a few questions. KL: How long has DOMOTEX Middle East been taking place? Angela: The first edition of DOMOTEX Middle East was launched in the year 2006. The 2010 show was the 5th edition of DOMOTEX Middle East. KL: How did the show get started? Angela: It was my vision to launch in Dubai the flagship of DOMOTEX Hannover which is a successful trade show for carpet and floor coverings organised by Deutsche Messe Hannover AG - one of the leading World Trade Fair organisers. KL: What makes it unique? Angela: DOMOTEX Middle East is the only international trade fair for carpets and floor coverings in the Middle East/North Africa (MENA) region. This is an important region of the world which has witnessed immense growth in the construction, hospitality and industrial sectors. Despite global downturn there has been a demand in the requirements and needs of the ongoing projects which are in process of completion in Dubai and our focus is to reach the growing wholesale markets not only in UAE but all over Gulf Cooperation Council (GCC) and MENA region. Consequently this has created opportunities for the carpet and floor coverings sector. 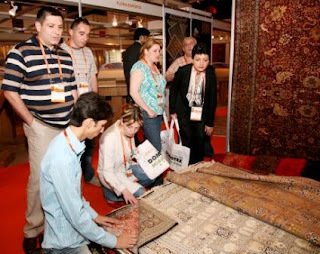 KL: How did DOMOTEX Middle East 2010 go? Angela: The fifth edition of DOMOTEX Middle East maintained its status as the only professional trade show dedicated to carpets and floor coverings in the Middle East and North Africa (MENA) region. Moreover this year’s exhibition became more attractive due to the combination of DOMOTEX Middle East along with R+T Middle East. Approximately 4,860 trade professionals from the MENA region visited the Dubai International Convention & Exhibition Centre (DICEC) from 10 to 12 May. The trade event targeted wholesalers and retailers as well as decision-makers from construction companies, architects, interior designers, project planners, floor layers and fitters. KL: Who exhibits at this show? Angela: DOMOTEX Middle East 2010 yet again succeeded in assembling a global selection of leading exhibitors who presented a comprehensive selection of carpets and floor coverings. The majority of the exhibitors were keen to find new business contacts, meet existing clients or partners and further raise their company profile in the Middle East market. Angela: Exhibitor’s countries of origin regionally comprise of Europe, Middle East and North Africa region (MENA), Far East, Indian Subcontinent and America. KL: What kinds of products are exhibited? Angela: A comprehensive selection of carpets and flooring products and services, including hand-made and machine-made carpets; textile and resilient floor coverings; parquet and other wood floors; laminates; ceramic tiles, natural stone floors and marble, floors for sports arenas and sports facilities; fibres, yarns and textiles; application and floor laying techniques and equipment; machinery and technology. KL: What are some of the other highlights? Angela: Visitors were also treated to practical demonstrations of application and installation systems via Creative Flooring which is a live “how-to” demonstration area, where our visitors could discover how to install mixed material combinations on a variety of surfaces including wall-to-wall carpet, wood flooring, carpet tiles and resilient flooring as well as find out the latest techniques on floor leveling (sponsored by Thomsit – Henkel Polybit) and the use of dust-free sanding and grinding tools (sponsored by Janser). The demonstrations were held by professionals of TAOFS ( The Academy of Flooring Skills) from the UK. The series of events offered a wide range of showcases, seminars and displays of designer flooring that were attended by architects and designers from across the region. Similarly the APID Flooring Seminar invited high profile speakers to conduct seminars at the DOMOTEX Middle East Designers Corner. 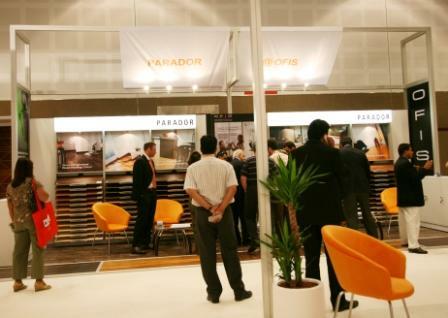 KL: Based on the success of this show, what's your perspective on the global flooring marketplace? Angela: DOMOTEX Middle East clearly benefited from the momentum generated by its parent tradeshow, DOMOTEX HANNOVER, in January and DOMOTEX Asia/CHINAFLOOR 2010, which was held in March this year, also recorded high visitor numbers, testifying to a resurgence in the Chinese floor covering sector whilst DOMOTEX Middle East 2010 continues to be a highly attractive destination for global suppliers of carpet and flooring solutions in the Middle East and North Africa (MENA) region. Thank you, Angela, and congratulations on a successful DOMOTEX Middle East 2010! Have you considered attending or participating in DOMOTEX Middle East? Do you have additional questions? Please don't hesitate to ask me. For more information about DOMOTEX Middle East, click on this link to the full 2010 recap document.